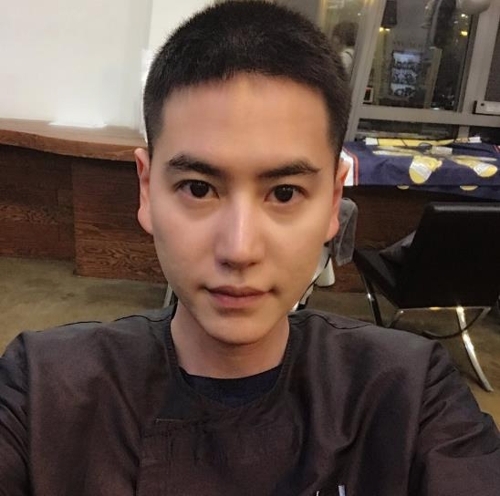 SEOUL, May 25 (Yonhap) — Kyuhyun, member of K-pop group Super Junior, on Thursday began his two-year compulsory military service. The 29-year-old singer was admitted to the Army boot camp in Nonsan, 213 kilometers south of Seoul. at 2 p.m. for his three-week basic military training. After receiving his training, Kyuhyun will fulfill his duty as a commuting public service worker due to physical injuries from a car accident in 2007. “Can’t get used to this. Don’t be sick, don’t cry and stay well!” Kyuhyun wrote on Twitter while also posting a photo of himself with his hair cut short. The singer added, “Until we meet again, good bye for now.” Kyuhyun released his digital single “Goodbye for Now” on Wednesday on the eve of the beginning of his military service. All able-bodied Korean men are required to complete 21 months of military service before the age of 35 in South Korea.